Just as Mon-El and Kara confessed their attraction to one another, they found themselves bewitched by a strange magical man who professed his own love for Kara. Taking her rejection as a challenge, this so-called Mister Mxzyptlk launches a campaign of chaos on National City, intending to make Supergirl into Mrs. Mxyzptlk! At the same time, Winn finds love with an alien woman and Alex tries to figure out just why Maggie doesn't want to celebrate Valentine's Day. The Supergirl comics of Sterling Gates (lots of references to Krypton and Kryptonian culture), Action Comics #291 - The Bride Of Mr. Mxyzptlk!, Disney's Aladdin (Mxyzptlk sings part of the song A Whole New World, the rules for what Mxyzptlk can do with his magic are similar to the rules governing genies), the stage musical Hamilton (Mxyzptlk puts himself and Mon-El on a stage, dressed as Aaron Burr and Alexander Hamilton, for their duel), the film Willy Wonka and the Chocolate Factory (Mxyzptlk quotes Willy Wonka while wearing a purple coat), various Superman cartoons and comics featuring Mister Mxyzptlk and various Supergirl stories where the villain wants to marry Supergirl and makes threats to force her to do so. Peter Gadiot proves a perfectly playful Mxyzptlk, finding the perfect balance between being amusing and annoying, thus portraying Mxyzptlk as an overgrown kid pulling on the pigtails of a girl he likes rather than a psychotic stalker. As per usual, the chemistry between Chris Wood and Melissa Benoist is one of the episode's best features. The CGI effects for Mxyzptlk's magic are some of the best this series has seen, from the blue sparkle effects when he works a spell to the scene where Kara has to fight a giant crystal statue of her uncle. While I usually abhor covers of classic rock songs, the cover of The Police's Every Little Thing She Does Is Magic played under the final scene of Mon-El and Kara together is rather nice and the perfect song for the scene. This episode was co-written by Sterling Gates, who wrote the Adventures of Supergirl tie-in comic based on the first season of the Supergirl TV series. He also wrote the Supergirl series right before the New 52 reboot and is generally considered to be the best writer to handle the character's monthly exploits in the past 15 years. The basic idea of this episode seems to have been taken from Action Comics #291 (August 1962) - The Bride Of Mr. Mxyzptlk! This comic marked Supergirl's first encounter with the 5th Dimensional Imp in the comics and, as in this episode, his scheme is to force Supergirl marry him. Mr. Mxyzptlk first appeared in Superman #30 (September 1944). His specific backstory and appearance have changed over time but his point of origin has remained consistent. As a being born of The Fifth Dimension, Mr. Mxyzptlk has the power to alter the third-dimensional realm at will. This power has been described as magical and is capable of affecting Superman, regardless on whether or not it might be considered "true" magic. In any event, Mr. Mxyzptlk is mischievous but not evil and usually only plays around with Superman out of boredom or to challenge himself. In the comics, the only way to get rid of Mr. Mxzyptlk was to trick him into saying, writing or otherwise spelling his name backwards - Kltpzyxm. In the DCTVU, Mr. Mxyzptlk has apparently never encountered Superman. His appearance here is the first recoreded instance of a Fifth Dimensional being on Earth apart from various legends involving genies, djinns, leprechauns and other creatures capable of altering reality with magic and wishes. The rule about getting him to say his name backwards also applies but it is, as Mon-El notes, much more trouble than it is worth if you don't have issues with just killing them. Mr. Mxyzptlk says that there is no one "as brave or bold" as Kara where he comes from. The Brave And The Bold is,a classic DC Comic series devoted to team-up stories. J'onn makes a reference to The Zook Uprising on Mars. In the Silver Age Martian Manhunter comics, Zook was the name of an alien being who acted as a pet/sidekick to J'onn J'onzz. Zook was a creature that resembled a cartoonish dog, who had the powers of temperature manipulation (he could freeze or super-heat objects he touched), limited shape-shifting abilities and he could track anyone whom he had met before, no matter how they had disguised themselves. In the 1998 Martian Manhunter comic series, Zook was the name of a Martian plant that could be fashioned into clothing that could shapeshift in tandem with a Martian. In the first scene at the bar, Winn is drinking Lallorian Lager. The planet Lallor comes from the Legion of Super-Heroes comics, where in the 30th century Lallor is ruled by a dictatorship. The planet had its own superhero team - The Heroes of Lallor - who fought against tyranny and worked alongside The Legion of Super-Heroes on several adventures. Lyra Strayd says that she is from the world of Starhaven. In the DC Comics universe, Starhaven is a fictional planet near the core of the Milky Way Galaxy and home to the Legion of Super-Heroes member Dawnstar. Winn claims to have translated a book from Starhaven called "The Book of The Ten-Pointed Star". Ten-pointed stars are a frequent motif in both Islamic artwork and Freemasonry. The duel scene in which Mxyzptlk teleports himself and Mon-El to fight for Kara on a theater stage dressed as Alexander Hamilton and Aaron Burr is a nod to the musical Hamilton. Mon-El swears to Rao that he will listen to Kara in the future. Rao is the name of a Kryptonian deity - a god of light and life, similar in scope to the Egyptian sun god Ra. It is also the name of the red star which Krypton (and in the DCTVU, Daxam) orbited. Kara threatens to kill herself by blowing up the Atomic Cauldron of The Fortress of Solitude. In the original comics, The Atomic Cauldron was the power source of the Fortress of Solitude. The most powerful furnace on Earth, the Atomic Cauldron ran on liquefied Sunstone crystals. Mxyzptlk makes a reference to Thoni Tea. In the original comics, Thon was an area of Krypton and tea was brewed from select plants on the hills on the Gorvan shore. One of the items Winn finds in the DEO basement tests off the charts in 5th Dimensional Energy. He has no idea what it would do to Mr. Mxyzptlk and can't analyze it further until a spectrometer finishes updating. This will take six hours. The device is later revealed to have the power to cut a 5th Dimensional being off from their home dimension, effectively making them powerless. According to Kara, the Atomic Cauldron of The Fortress of Solitude is one of the most powerful fusion furnaces on Earth. She can overload the Suntones at its core, creating an explosion equivalent to a 400-megaton bomb. This is roughly equivalent to 30,000 of the atomic bomb that was dropped on Hiroshima. The shields of The Fortress of Solitude are strong enough to contain a 400 megaton blast. Anyone inside the Fortress, however - even a Kryptonian - would be completely vaporized. Kara: What is - ? Are you crazy? You cannot just put me in a wedding dress! Mxyzptlk: Why not? It's Vera Wang! 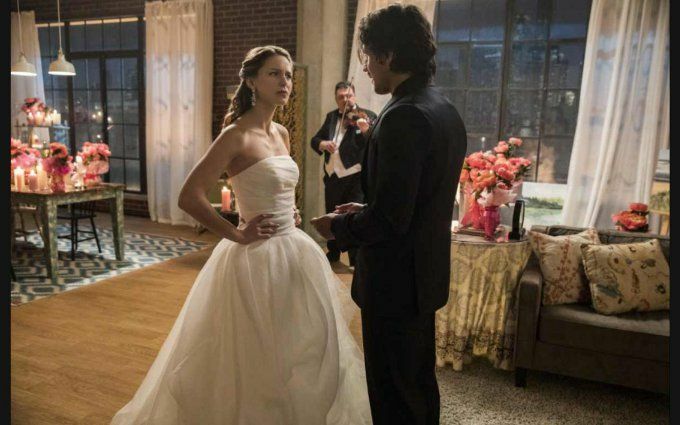 Kara: I'm flattered... but I'm not going to marry you, Mxyzptlk. Mxyzptlk: You know, it's funny. I'm all-seeing and all-powerful but that's one of the few things I can't make you do. That and make you fall in love with me and/or stop you from killing yourself and/or make you drink orange juice, for some reason! Everything else, yes, but go figure. Kara: Okay Okay. So the trimmings aren't her style, but you can celebrate your own way. What kind of stuff does she like? Mon-El: Oh... I'm sorry that I was busy, uh, defending your honor! Kara: (freezing in place, turning around, furious) I am not some damsel in distress! I am Supergirl! I can defend myself! And more importantly... I told you I was handling it! Mon-El: Well, Kara sometimes you're not a good judge of what you can handle, so... (shrugs and claps his hands) there it is. Kara: Is that why you didn't tell me that the secret to getting Mixxie off Earth was to get him to say his name backwards? Because you didn't think I could handle it? Mon-El: No. I didn't tell you that because it never works! Because first of all, it's hard enough to say it forward. And second of all, that guy is a motor-mouth but he's not stupid! Winn: I need a relationship pearl. Mon-El: How could you think she'd ever want to be with someone like you? Mxyzptlk: Why? You think she's going to be with you?! Face it! What have you got to offer her? I can give her everything. There's no contest between you and me and you know it! I'm a god and you're a loser. Mon-El: You're a dead man. Mxyzptlk: Strike that. (holds up the power-draining device that he just pick-pocketed off Mon-El) Reverse it. Mxyzptlk: (sing-song voice) Kara, darling? Where arrrrrrrree yooooooou? It's time! Kara? You said noon! And here I am! (angrier) Kara! Supergirl: (landing behind him) I can hear you. Mxyzptlk: Where's the dress? The flowers? The pigs in blankets? Supergirl: See, that's the thing, Mixxie... I'm not going to marry you. Mxyzptlk: No! You made me write my name backwards! Supergirl: Yep. On some planets to write something down is to truly say it. Supergirl: No. No, I followed the rules. You say your name backwards. You go back to The Fifth Dimension. No questions asked. Mxyzptlk: I just wanted... I wanted someone to love me. Supergirl: You can't force love, Mxyzptlk. You have to let it find you. Lyra: I didn't think you'd call. Winn: Why? Last night was... like, beyond amazing on just so many levels. Lyra: I figured it was a one-time thing for you. An experience. I've never met a human that was actually up for dating an alien. Winn: Well, now you have. (chuckles) Look, I'm not naive, okay? I know that there are lots of people who don't think that humans and aliens should mix. If we're being super honest, I... potentially falling for an alien is not what scares me. It's falling for anyone. Just have... kind of... had my heart trampled on a few times. Winn: Lyra...you aren't like some experience to me, okay? You are a potentially... real, fulfilling, challenging relationship and that's... that's just way too much chaos. That's too fast. (makes a back-pedaling gesture) Whoo-hoo. Just gonna... uh...heh. Um... what do you say we just take it slow? Lyra: (whispering) Slow. (pauses) Take me to where you live. Mon-El: I get that you were upset that I wasn't listening to you. And I... I tried really, really, really hard to listen to you this time. And I heard that you.. you don't think that we belong together, and I respected that. Kara: No, but... Mixxie wasn't the only one that I tricked. Mon-El: What do you mean? Mon-El: Wait, so... you didn't mean any of that stuff that you said? Kara: Well, the first bit about your infurating male ego? That part I meant. Kara: But the second part? About us not being a match? I didn't mean that. Mon-El: (impressed) Wow. No, you're good. You're good. Mon-El: (nodding) Well, you... got rid of Mixxie. Mon-El: That means nothing is... nothing is stopping us. Kara: Nope. Nothing is stopping us. Mxyzptlk: You don't get to tell me what to do until after we're married! Mister Mxyzptlk claims to be all-seeing and all-powerful but his magic does have limits. He cannot make someone marry him, fall in love with him, stop them from killing themselves and/or (for some reason) force them to drink orange juice. J'onn encountered a 5th Dimensional Being once on Mars. That being moved the Xan'Xie mountains halfway across the planet during the Zook Uprising. Mon-El says Daxam had contact with The 5th Dimension and had a zero-tolerance policy regarding 5th Dimensional Beings being allowed on the planet. He says 5th Dimensional Beings knew how to party but were very dangerous. To that end, the preferred method of dealing with a 5th Dimensional Being on Daxam is to slay them as quickly as possible - preferably via crushing. Martians celebrate a custom similar to Valentines Day, where written messages are sent to loved ones. Since Martians are a telepathic species and thoughts were easily exchanged between them, important and intimate communications were written down as a symbolic gesture. J'onn notes that on some planet (Mars among them) it is believed that to write something down is to truly say it. Maggie's usual breakfast is a seasame seed bagel, dry, double toasted with black coffee. Alex feels this is gross. Eliza Danvers makes a big deal out of Valentine's Day and sends her daughters cards to honor it. Maggie hates Valentine's Day. Alex loves it . Winn's drink of choice is Lallorian Lager. Reportedly it is considered a drink for weak-willed idiots. The woman who saves Winn in the bar is named Lyra Strayd. She is from Starhaven, which was mentioned in 114, where Kara noted that she had visited the planet as a young girl and that the air smells like cinnamon. Apparently she told this story to Winn at some point. A blight came to Starhaven which apparently destroyed the cinnamon smell. Winn translated a passage from a book from Starhaven called "The Book of The Ten-Pointed Star" - "The hurt of one is the hurt of all. The honor of one is the honor of all." Lyra says that her father read to her from that book every night when she was a child. Maggie likes guns, scotch, tiramisu and bonsai trees. The Parasite - last seen in 206 - appears as one of Mxyzptlk's illusions. A Fifth Dimensional Being can be forced to return to their home dimension if they are made to say their name backwards. Mon-El is on a first-name basis with a DEO agent named Dana. Maggie Sawyer was lying in 206 when she said her family was comfortable with her coming out. The truth is that she fell for a friend named Elisa Wilkey when she was 14. The two watched horror movies and smoked cigarettes in private together. On Valentine's Day, Maggie gave her a card with a note about how she felt. Elisa gave that card to her parents, who called Maggie's parents. Maggie was kicked out of the house that day and had to go live with an aunt for the next three years. This is why Maggie hates Valentine's Day. Winn makes reference to getting reservations for a certain restaurant being more difficult than getting a Hellgramite to eat leafy greens. Kara fought a Hellgramite in 102, where it was revealed that they were chlorine-based lifeforms that the only things on Earth they could eat safely were certain chemical compounds such as DDT. Winn grew up in Newark, New Jersey. Winn and Lyra spend Valentine's Day together. They agree to try and start a relationship together. Maggie sets up a "Valentine's Day prom" for Alex to make up for screwing up her Valentine's Day plan. The episode ends with Mon-El and Kara making out on her couch. A perfect Valentine's Day special, hampered only slightly by the fact that it aired the week after Valentine's Day. But why quibble? Kara and Mon-El are finally together and the other romantic subplots all work perfectly. It's nice to see Maggie (for once) admitting to a misstep in her relationship with Alex after several episodes with Alex being the one to make things weird. The Winn subplot surprised me in that I was sure his new lady friend was probably going to be a black widow and lay her eggs in him after mating. And heaven help us, they made Mxyzptlk work in live action. Sterling Gates needs to write more episodes of this show.